Interesting subject choices, decals in perfect register with minimal carrier film, a good set of instructions that quote the references used. 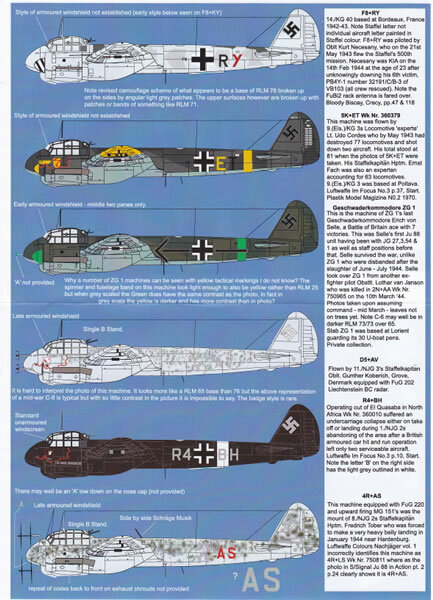 Excellent quality and great variety of markings for the Dragon / Revell 1/48 scale Junkers Ju 88 C-6. 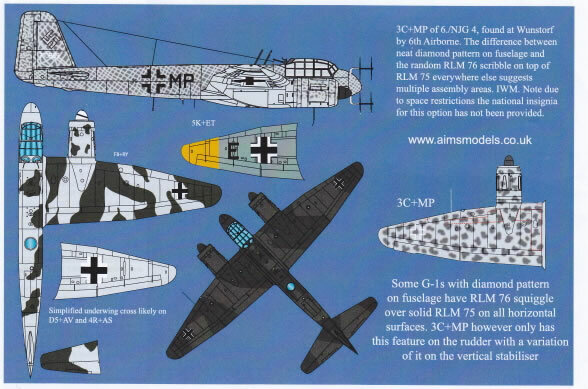 AIMS Decals continues its love affair with the Junkers Ju 88, this time with a 1/48 scale decal sheet covering six Ju 88 C-6s and one Ju 88 G-1. Ju 88 C-6 - Chevron and bars Kdore ZG 1. This aircraft is finished in a conventional scheme of RLM 70/71 Greens over RLM 65 Light Blue. The huge Geschwaderkommodore markings lend a great deal of interest though. The spinners and fuselage band are either RLM 25 Green or RLM 04 Yellow. Ju 88 C-6 - F8+RY 14./KG 40. This machine has large pale patches on the upper surface, and pale fuselage sides. The instructions suggest overall 76 broken up by patches of something like RLM 71, but I think it is more likely that the airframe started out in standard RLM 70 and 71 upper surfaces, and the pale colour - maybe RLM 76 Light Blue - was sprayed over that. Pale patches on the side may be overpainting of previous markings in RLM 65 or RLM 77. A fascinating study, this one. Ju 88 C-6 - 5K+ET 9./KG 3. This aircraft is finished in a conventional scheme of RLM 70/71 Greens over RLM 65 Light Blue. Ju 88 C-6 - R4+BH 1./NJG 2. Overall RLM 22 Black night fighter. Ju 88 C-6 - D5+AV 11./NJG 3. Another interesting scheme. Either RLM 65 or 76 base colour with an irregular, small mottle of RLM 75 Grey Violet. Equipped with Lichtenstein BC radar array, and an unusua; variation on the night fighter badge. Ju 88 C-6 - 4R+AS 8./NJG 2. The colour notes don't hazard any suggestions, but this one is probably RLM 76 Light Blue base coat with messy mottles of RLM 75 Grey Violet and RLM 74 Grey Green on the upper surfaces and fuselage sides. FuG 220 radar and upward firing Schrage Musik cannon are fitted. Ju 88 G-1 3C+MP 6./NJG 4. Another interesting scheme and one to challenge even the most dextrous airbrusher. This aircraft has a tight cross-hatch pattern on RLM 76 over RLM 75 on the fuselage and a squiggle pattern on the rudder, with a more conventional mottle on the top of the wings. FuG 220 radar and Schrage Musik cannon are fitted to this one too. Instructions are supplied on one full colour double-sided A4 sheet. All seven side profiles are accompanied by a useful text description. Three different upper plan views (two are partial) assist with the painting of the camouflage schemes. The decals are beautifully printed by Cartograf. Carrier film is thin and the markings are in perfect register. 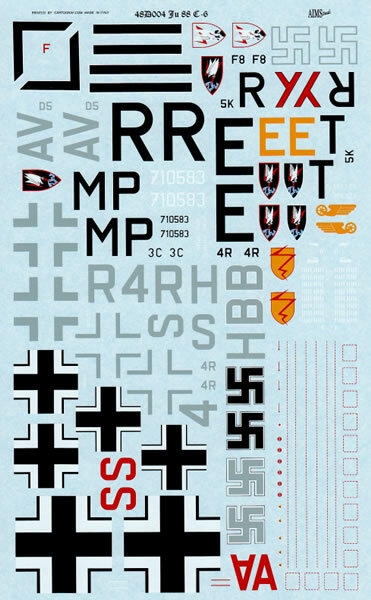 This decal release is a welcome upgrade to the Dragon and Revell boxings of the Junkers Ju 88 C in 1/48 scale. Dragon's kit is a pain to build, but it is accurate, crisply detailed and looks impressive when finished. Any of these schemes will look great on the completed model.